Leading Manufacturer of tea dryer's hot water steam radiators from Chennai. 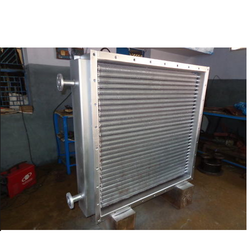 Backed up with our technical support we are manufacturing Hot Water Radiator for Tea Dryers. Compared to other type hot water radiators we manufacturer our radiator with Aluminium Extruded finned tubes. It leads to higher heat transfer efficiency as the fins and base tubes gets mechanically bonded with base tube. so there will not be any air gap between fin and the tube. So the heat transfer will be 100%.